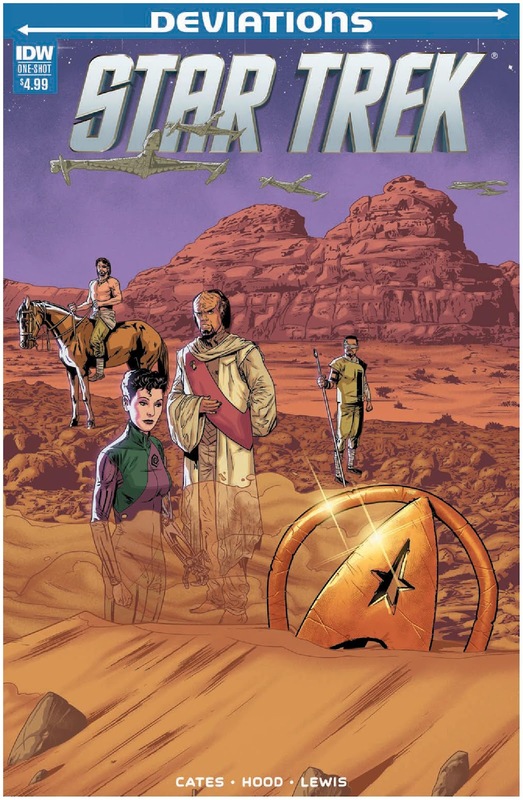 The Fellowship was fortunate enough to obtain a copy of STAR TREK: DEVIATIONS from IDW Publishing. The story is written by Donny Cates, illustrated by Josh Hood, colors by AndWorld Design, and lettered by Fabio Amelia, with production design by Neil Uyetake. DEVIATIONS is IDW Publishing’s line of books where a well-known story is altered to go down a different path. In this case instead of Vulcans coming to Earth and making first contact, it was Romulans. Or at least that is what we are told. We at the Fellowship have become big fans of Donny Cates, so when I realized he was writing this I had to read it. Was I disappointed? Only in the fact that this was a one-shot with SO many questions left unanswered. Cates crafts an intriguing and action-packed story, but stayed true to the characters that we know so well. Hood does a great job of the actors’ likeness even through the harsh conditions they endured, but obviously enjoyed the freedom to create new environments. I want to know more, the story MUST continue! STAR TREK: DEVIATIONS is in stores now or available at www.idwpublishing.com.